The alpha radiation can be both seen and heard. Visualize alpha particles with this spark detector. When alpha particles ionize the air in the spark detector’s aperture, sparks can be both seen and heard. 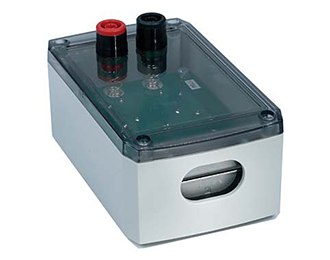 The transparent lid allows observation from several different directions. The spark detector needs to be connected to a high-voltage supply such as SF-9586B. Normal operating voltage is between 2 and 5 kV. The spark detector can be placed directly on a table or mounted in ordinary stand hardware using the supplied mounting post. Supplied with instructions and experiment ideas.